CDU Alice Springs, in conjunction with the Australia Day Council, will present a lecture by Australian of the Year award recipient and Melbourne restaurateur Shanaka Fernando. The free lecture will take place on Tuesday, 21 August at 1.30 in the New Higher Education Lecture Theatre. Shanaka has established a chain of successful non-profit, co-operative restaurants allowing customers to determine the price of food. The business represented compassion, individuality, and artistic expression under a philosophy that challenged and defied consumerist society, Shanaka said. He started his first ‘Lentil as Anything’ restaurant after relinquishing his personal capital in a first restaurant and turning it into a venue for artists and writers. It has since grown into four restaurants across Melbourne, employing about 80 young people and providing space for artists and writers. 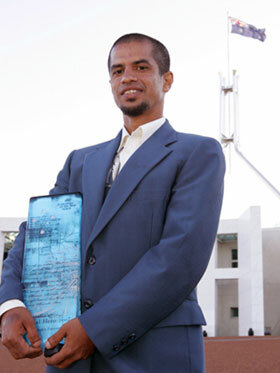 Shanaka received a ‘Local Hero award’ for 2007 by the Australia Day Council, acknowledging extraordinary contributions made by Australians in their local communities. The restaurant operates on a policy of ‘no set prices’, where customers pay only what they can afford or what they think the meal was worth. ‘It encourages people to have an internal conversation with their conscience and their ethics,’ he said. RSVP attendance at the free lecture to Nikelle Newlands on 8959 5200 or email nikelle.newlands@cdu.edu.au.